Easy access between Doncaster & Hull, 2m from J36, M62. Close to A1 and M18. Turn off M62 at J36, right at roundabout A614 to Goole. Follow the brown 'Viking Marina' tourist signs. Follow road past roundabout to next lights at dock entrance. Turn right signposted 'South Docks'. Turn right again after 50yds, before canal bridge, Albert Street. Continue along Albert Street, turn left at brick wall with our sign. 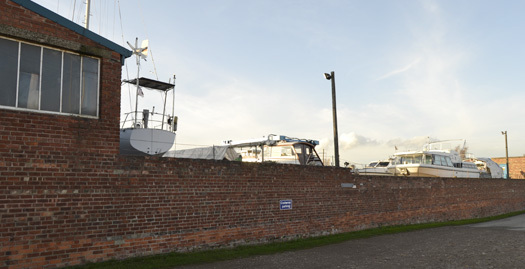 From the Ouse and the Humber, through Ocean lock in Goole and follow the Aire and Calder canal. Viking Marina is the first Marina on the right. From inland waterways- follow the Aire and Calder to Goole and we are the last Marina onthe left.